Yoga is today widely considered as a science and art of wellness. Its popularity is widespread across the world. But a new yoga studio has still to compete hard with dozens of established and new yoga trainers even in a small town. Big cities are home to hundreds of studios that are your direct competitors. So, a catchy but unique business name of your studio can draw the potential customers’ attention. If you want to start a yoga business, consider it a wise decision. After all, nothing is better than earning from what you learn by practicing yoga from experienced teachers or gurus. So, you will not only impart the education of yoga asanas but make it your livelihood as well. But is your yoga studio name is good enough to attract potential students or trainees? That is the question to be asked and answered first before you set up the studio. A business name holds significance for people as they get some hints from it about what your business does. A confusing name may discourage them to visit your studio. They will then go to your competitors’ studios which are many in your town. The business of yoga is thriving everywhere. In the U.S, yoga business is expected to generate $ 11.56 billion in 2022 from $9.9 billion in 2015. Your new yoga studio, therefore, has many opportunities to grow with ever-increasing demand from a health-conscious audience. But run your studio like a business as well if it has to grow financially. This should compel you to take the right step to drive customers. The very first step is to name your yoga studio. Its name matters for conveying your purpose of opening the studio and the message it carries for the yoga enthusiasts. But that is not the sole reason behind selecting the name. There are, in fact, many factors to consider in choosing the right name that does justice to your yoga business. The first thing to do for naming your yoga studio is to set goals for the brand. Without these goals, the naming process may go directionless. What exactly you want to achieve from running the studio? Do you want to treat the studio as a means of earning your livelihood or there is something else to it? Perhaps your goal is to bring as many people as you can in yoga way of life. So, there should be clarity of mind regarding the goals you have set. You can then think of the words and phrases that connect with the set goals emotionally. Your brand goals will help you also at the next stage when marketing the studio. For that, you will be creating visuals like yoga logo designs as your identity of the business. Looking for a yoga logo design? You must also be clear about your target market. Several forms of yoga are now available to people. While this is an ancient Indian wellness exercise involving several asanas, many modern versions are cropping up as well. So, who are the customers that your yoga studio wants to target? You already know the niche, which is the type of yoga you are teaching. Then, find out who are the likely customers of that type of yoga. For example, not all people will be interested in Kundalini yoga that your studio intends to teach. This means you must know who are those set of people involved in this type of yoga. Once you have found out the target market, consider it in naming the studio. That will guide you in picking the right name. Moreover, when you create a fitness logo design for your studio, you will be able to use the right colors, typeface, etc. in the logo, which will be your trademark. Yoga has now taken different modern forms, which you must consider. You may be running a studio that teaches one of the most recent additions to the ancient practice. For example, Bikram Yoga and Yin Yoga are new practices. Then, Vinyasa Yoga is also a new addition. There are, in fact, many types of Yoga such as Hatha Yoga, Kundalini Yoga, Hot Yoga, Ashtanga Yoga, Kripalu Yoga, Jivamukti Yoga, and many others. So, which type of yoga teaching your studio intends to impart. This will help you in picking the right name. In the U.S, most yoga practitioners are female. According to an estimate, over 70 percent of the practitioner in the country are females. These women come from a high-income section, and they fall in the age group of 18 to 34. But yoga is popular with the people aged 35 to 54. Yoga studios should, therefore, find out such demographic interests. What yoga studio names your competitors have? Find out those names in the yoga niche you are active. There may be dozens of studios that provide the same training your studio would provide. Its one purpose is to have a name that stands out. That is important if you wish to create a place for your business. It is to be noted that your visuals of the studio such as a logo will look different if the name is memorable, simple, and unique. Your logo designer can, then, create the logo around your studio name. Instead of just one person given the job of picking your yoga studio name, it is better to involve more people in the process. Just make your team members sit around a table and have some names discussed. Ask them to suggest the names. Request them to give their reasons for recommending a name. If no one name can be finalized, have more brainstorming sessions. You can also take a resort in some name generating software. Write down some keywords in the search box of the name generator to get dozens of names. Then, discuss those names to find out which could be the near best. Your team members also should discuss which name will look good on logos, stationery, websites, your brochure design, and other online and offline platforms. Simplicity is the key to most of the things that we want to achieve in life. That is also true to choosing a yoga studio name. Any complexities in spelling, choice of words, and in its pronunciation is not desirable. A difficult name is not only harder to pronounce but to write also. People may not remember it correctly when typing on the search box. Such names are generally not like as they are not easily memorable. So, prefer having a name that is short and simple. Choose common words if your target audience comes from the middle-income group. But you can pick some simple but unusual words as a name to target affluent class as your audience. A simple name also looks good on your logo and other visuals such as your business card design that has your contact details. You should avoid the words and phrases that are trending. A disadvantage of trends is that they fade away soon and they go out of favor. So, ignore the trendy words. Instead, think of some new words to express your brand message. Avoid a lengthy name that people find difficult to pronounce. Even if the trend favors a lengthy name, avoid it. Can you come out with a name that does not have the word yoga in it? It is difficult, but give it a try. You should prefer having a name that is unique but simple. Remember that when hiring graphic design services of a designer, the unique name will encourage for creating a unique brochure, business card, logo, etc. After covering all the aspects of the naming process, you finally picked the most appropriate name, but is it available as a domain name as well? To have a domain name is important as you would be putting a website to promote your yoga studio. So, go to the sites like GoDaddy and check for the domain availability. If the name has already been taken as a domain, then do not worry. You still have some options. If the .com is not available, then try getting the other domains such as .net, etc. You can also contact the domain name owner to purchase it if the owner is selling it. Remember that your domain is essential to having a website. It is after getting the domain that you should hire a professional graphic designer to create a website for your yoga business. 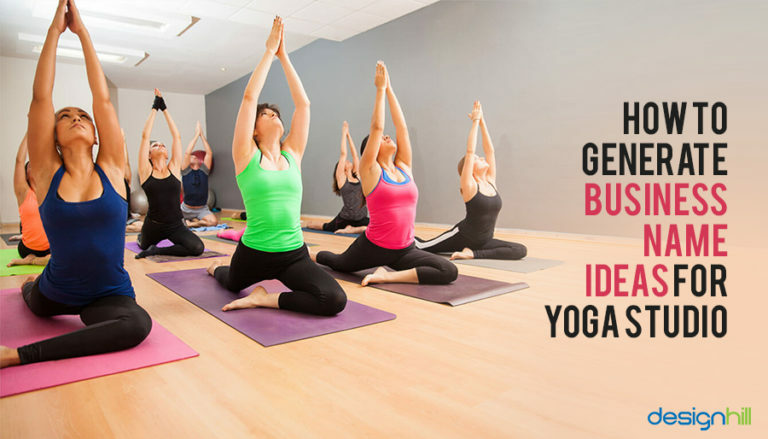 Make sure that after choosing a perfect name for your yoga studio, you register it at the first opportunity. This is because hundreds of names are registered daily in your niche. Someone may grab the name you found suitable for your business. So, do not delay the registration with the authorities. However, you must also check if the name can be registered. If someone already has registered the name, then settle for other names. But registering of the name is essential to give your yoga business brand identity. Another effective way to name your business is to have some inspiration. In fact, inspiration is vital to all creative works. So, what could be the source? We suggest that you have a closure look at the famous yoga studio names. You can learn that those studios have simple names. None of them are complicated names. Which name you like the most and why? Such analysis and inspiration surely work in picking a name that works. The right name is also essential when you will be creating visuals for your yoga studio. The name should fit well with various graphic design ideas that you will have from the designers for logos, brochures, etc. When naming your business, you are too close to the entire process. That may even blur your thinking and vision. But if you get a second opinion, you can rectify the mistakes. So, it is always advisable to get feedback on the name you selected. The feedback can come from any person including an expert. To get many people involved in naming your yoga studio, just post the shortlisted names on your social page. You created a beautiful social media page design to educate people on yoga. Now use those pages also to get people’s feedback on your business name. These are the crucial points to consider when going through the process of naming a yoga studio. Rarely a business name is finalized quickly. In most such cases, some names are shortlisted after a long discussion about the pros and cons of different names. So, you must show some patience as you may take many days before picking the right name. Once you give a name to your yoga studio, the next step should be to take the business to the audience. For that, you should build a widespread perception of potential customers about the studio. So, you will need various visual identities like your studio logo, business card, website, brochures, and many more. Here, Designhill can come to your help by providing you with plenty of design ideas at one affordable price. You have no risks as the site offers 100% Money Back Guarantee if you do not pick a winning design. A yoga studio is a center for physical and mental wellbeing. Its name should reflect the type of yoga a studio teaches and the message it has for the audience. A simple but unique name that stands out is desirable for making a lasting impression on potential customers. But the name must also be available as a domain and for registration.